We started our day in Indianapolis off with brunch at Le Peep where I had a garden wrap. We then took a tour of the Motor Speedway which is home to the Indy 500 race. The race track was gigantic. I liked the way the drivers faces were moulded in to the cup. There were lots of pretty cars and we picked our favourite two. Tom's was a blue corvette and mine was called the Pink Zink. It was fun getting to sit inside the car, it was far more recligned than I had imagined it would be. 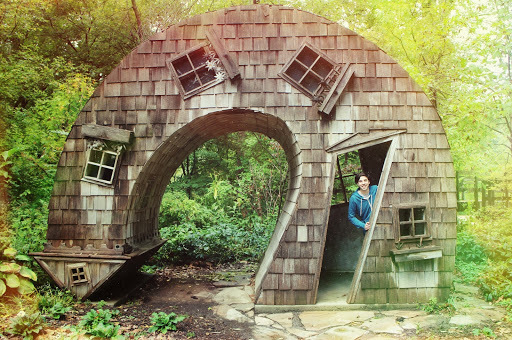 We stopped off at the Indianapolis Art Center on the drive back in to town which had this amazing twisty house in it's gardens. I loved the topsy turvy windows the most. We also passed drove past the Children's Museum which had giant dinosaurs crashing through the building. There was a giant thunder storm in the evening, so we sheltered at a dive bar called The Sinking Ship which served awesome vegan food. I had a meatball sub with side of mac n cheese. Afterwards we went to the triple drive-in movie feature at Tibb's Drive-In. The storm meant they had to stop the films early but we managed to see Cloudy With A Chance Of Meatballs 2 and The Butler.